Well, I'm back. I promise that I'll return to knitting content eventually. Just not now. Right now you'll have to bear with my vacation recap. It's definitely not NYC, so sit back and enjoy the vicarious living. Death Valley was tackled by me, my parents, and my lovely sister (with my lovely brother not able to make it). Family vacations are nothing new, having been herded around to a heaping helping of various museums, Civil War battlefields, and other educational opportunities as a child. All things considered, I've always been lucky enough to get along fairly well with my siblings, but our camaraderie usually came in the form of banding together to declare ourselves thoroughly unimpressed with the Bay of Fundy. What was new about this particular vacation was my baby sister Emily, who now tops out at the ripe ol' age of 20, is growing up. Miracle of miracles, the girl is good company. That's not to say we didn't regress right on back to the days of yore, we took pride in our searches for bugs, dung, and other creature features. It was priceless to have a hiking partner who humored me by crying "Valley Ho" every day before we hit the trail. At Emily's mere mention of coconuts, I was ready to proceed down the canyon at a lively canter and bang rocks together. Never mind that she was longing for coconut foot cream, I automatically scored points for assuming that she was talking about Monty Python. Here's a few more tidbits from the highlight reel. I love the shift of time on the trail. Our average bedtime was 8 PM, rising with the sun around 6 to clamber around the rocks before breakfast. It's not a schedule I could regularly keep, but I love the natural rhythm that life develops when activity revolves with the sun. Our trip was a guided camp/hike through REI Adventures. The group topped out at 12 hikers, with a 50 year gap between the oldest and youngest hikers (the youngest being baby sister). 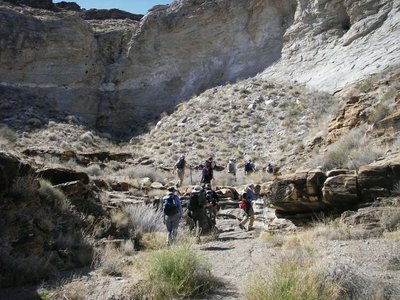 Note to self, I want to be in the kind of shape that allows me to sign up for six days of desert canyon hiking when I hit 70. As the youngest members of the party, Emily and I hold the dubious distinction of being the only two to fall, get stung, and drop rocks on our toes (that would be Emily knocking a small boulder on to my big toe). We also displayed an uncanny knack for poking and prodding plants that inevitably turned out to be prickly, poisonous, or both. Ahhhh, the joys of youth. 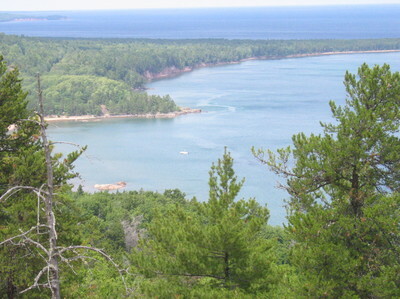 Most of my hiking and backpacking experience hails from the lakes and woods of the Upper Midwest. Put me in a desert mountain range and I lose all sense of direction and scale. What looks to be a stroll across the valley is more likely to be a 10 mile trek. 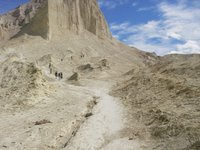 Our back country guide took us into the far reaches of the park, which often lacked trails. His hiking strategy often took the form of, " See that white rock way over there on top of that ridge? Head in that direction." It was fun to feel like you were blazing your own trail through the scrub. There was a full moon out lastt week. 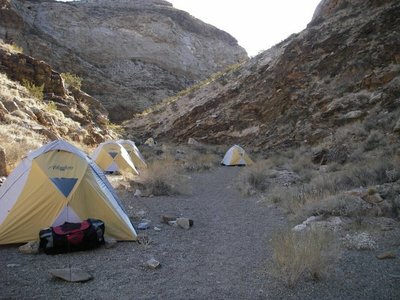 Imagine watching the moon rise over the cliff behind our campsite. Awesome. The desert wildflowers were finishing their blooms. 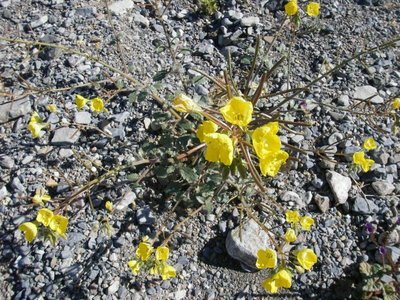 It is amazing that they have the strength to push up through the rocky soil and flourish in such harsh conditions. Death Valley has some old rocks. 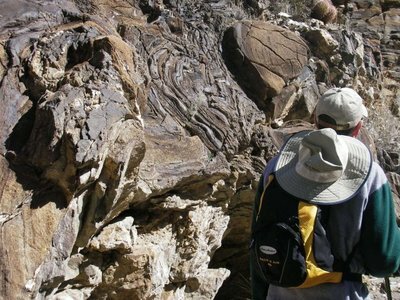 Every canyon we hiked had fascinating geologic features - mosaic rock formations, fault lines, and compressions of a million zillion years ago. 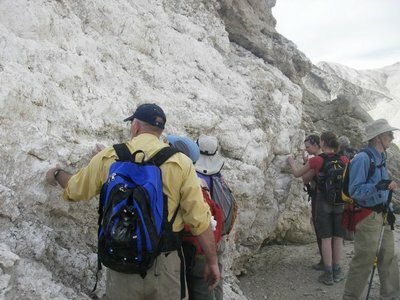 Here's the group stopping to check out some borax deposits. That's me and Emily in the background, sniffing (and later tasting) the borax. For the record, borax doesn't taste like chicken, just soap. Segueing smoothly away from Death Valley, let's get back to the Monty Python. Here's a fun quiz for you. In case you're wondering, I came out as Patsy, King Arthur's loyal coconut carrying servant. Confession: I was hoping to be Patsy, as he is my favorite, so the outcome was totally rigged. I'm making a bee line straight outta Brooklyn. By this time tomorrow I'll be walking through the Valley of Death. 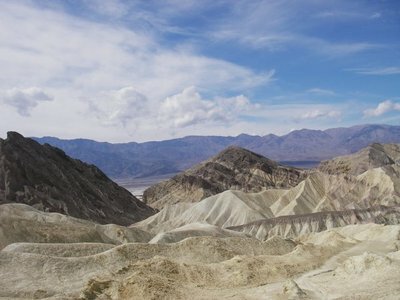 Oops, I mean Death Valley, which is where I'll be hiking for six days avec La Famille GDB (minus my brother who can't make it). One revealing glimpse into my pack would expose a headlamp, specially purchased for camp site knitting. Yep, I've got all the essentials and will have stories to share upon my return. Blogging has been curtailed by a missing digital camera, it just isn't the same to write about knitting progress without pictures to match. Said camera went missing after B and I made a trip to the Bronx for a heated roller derby match (is that the right word?) between the NYC Gotham Girls and the Wisconsin Dairyland Dolls. Despite my NY habitation, I wore a pint-sized Packers jersey to the event and am proud to report the triumph of Wisconsin over NYC. So, if you find a camera with multiple shots of derby action followed by an account of subsequent attempts to roller skate ourselves, please drop me a line! 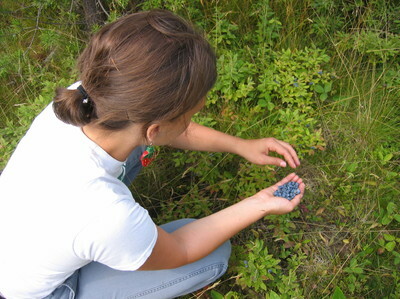 In the meantime, here are last known camera pics, taken while picking wild blueberries with B and my grandma (Nanna, wife of Poppa of humpus gumpus infamy) in Michigan (Heather - hope you enjoy!). 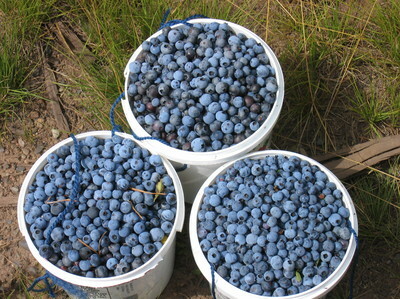 The homemade blueberry jam that followed will last us until the next blueberry season and provide cause enough for a tea with jam and bread party! 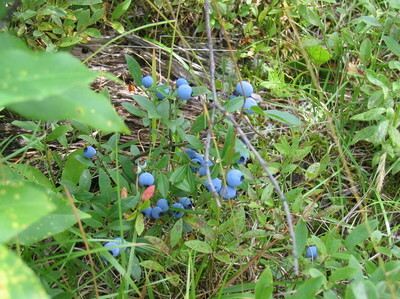 This last Michigan shot of Lake Superior is blueberry free, but pretty nonetheless. Nothing compensates for a lack of blog entries like a slew of random gratuitous pics (at least that's what I keep telling myself). Apologies for the blurry shot. Hopefully you are too blown away by my proximity to the track at Churchhill Downs to criticize my skills (or lack thereof) as a photographer. 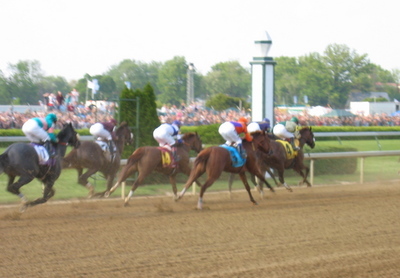 Drinking mint juleps at the Kentucky Derby is like drinking champagne on New Year's Eve - you can't imagine celebrating one without the other. 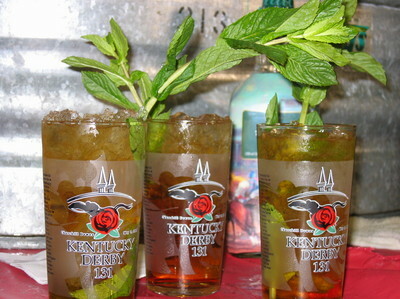 So you can imagine my disappointment when I learned that Derby juleps are made from a bottled mix - the horror! So who says it has to be Derby Day to have a mint julep? I myself plan to enjoy one whenever the Southern spirit moves me. Put the mint leaves and the syrup in the bottom of a tall glass. Crush the leaves to extract the flavor with the handle of a wooden spoon. Fill the glass with crushed ice and pour in the bourbon. Agitate to chill and mix. Garnish with a sprig of mint. Cheers! My first joint craft project with B - a sock monkey for his nephew, Jack. Two generations of sock monkeys - made for me by my Aunt Joyce and made for Jack by me and B.